Address: 628240 Khanty-Mansiysky АО, Sovetsky r-n, Sovetsky, Lenina st., 4. Zapovednik Malaya Sosva, in Khanty-Mansiysky Autonomous Okrug was established in 1976, partly on the territory of the ex-Kondo-Sosvinsky Zapovednik. Its area is 225,6 thousand ha. 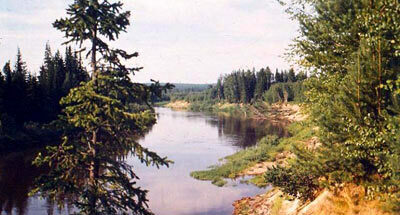 Located on the upland plain in the basin of the Malaya Sosva River. The territory includes a floodplain with above-floodplain terraces. 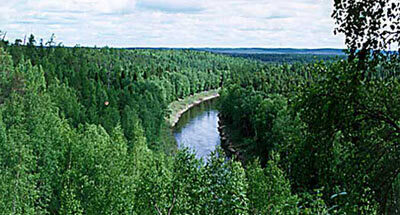 The Zapovednik protects the nature complexes of middle taiga of Western Siberia. Woodland covers over 84% of the area territory; bogs (mostly sphagnum) account for 14,5% of the area. In the valleys grow dark coniferous forests of Siberian spruce with an admixture of larch, fir, birch, Siberian pine, and also thickets of alder and willow. Sandy soils support pine forests. The major forest-forming species are the Siberian spruce and Siberian pine. The understory is formed of bird cherry, honeysuckle, Duschekia fruticosa. The herb-shrub layer is formed by cowberry (Vaccinium vitis-idaea), whortleberry, Andromeda polyfolia, field horsetail and wood horsetail. In marshy areas sedges and also cottongrasses are characteristic. There are about 360 plant species, including 45 trees and shrubs. Plants rare for Siberia are to be found, including the prickly rose, white beak sedge, lesser twayblade, etc. 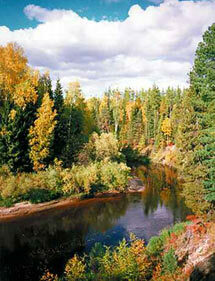 The animal life is characteristic of Western-Siberian taiga. The main object of protection is the unique native population of European beaver. The mammals ranging through the Zapovednik are the wild reindeer, moose, brown bear, lynx, sable, ermine, red fox, European hare, squirrel, chipmunk. The characteristic birds are: the capercaillie, black grouse, hazel grouse, white-tailed eagle, nutcracker, Siberian jay. The rare birds of the Zapovednik are the osprey, peregrine falcon, Siberian crane. In water bodies 14 fish species dwell, including Sosva herring, grayling. Since 1977 the Verkhnekondinsky Federal Nature Sakaznik has been affiliated with the Zapovednik. The Zakaznik was established in an area of 241,6 thousand ha in 1971.